Somerset moved ahead of Glamorgan in the One-Day Cup South Group after a 33-run victory on a firm pitch at Taunton. Glamorgan's revised target of 313 in 47 overs proved beyond them as most of the top order got set but did not cash in. Lewis Gregory, Roelof van der Merwe and Craig Overton all claimed timely wickets. 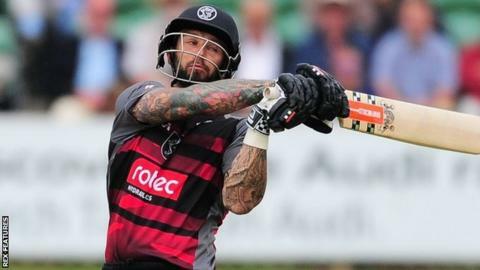 Somerset's first six all made useful scores, Peter Trego leading the way as he hammered 80 off 76 balls, well supported by Jim Allenby (53). Glamorgan were thankful that they managed to cut off the hard-hitting Johan Myburgh (39) and Mahela Jayawardene (37) before they could inflict more damage. Michael Hogan claimed vital wickets in the closing stages to put the brakes on, despite a late flourish from Overton (37 not out), after Glamorgan were forced to shuffle through seven bowlers in the first 20 overs. Glamorgan started well with a stand of 68 between Jacques Rudolph (36) and David Lloyd (46) but lost three quick wickets, two to attempted reverse-sweeps off left-arm spinner van der Merwe. After a rain-break, Colin Ingram (32) and Aneurin Donald (39) then holed out to boundary catches off Craig Overton to tilt the game decisively Somerset's way, despite some superb late hitting from Andrew Salter (42). Gregory's catch to dismiss Donald was a particularly fine effort to remove the in-form teenager. Both teams continue their campaigns on Tuesday 26 July, when Somerset host Middlesex and Glamorgan travel to Chelmsford to play Essex. "We got early wickets which helped us, then the rain meant the rate went up a bit and Duckworth-Lewis went in our favour. We kept taking wickets at regular intervals and it paved the way towards the end. "When we came back on after rain we got Ingram and then Donald, it swung our way and we kept taking wickets at crucial stages. "It was quite a strange wicket and the ball didn't quite come on as we thought, so it was hard for the batters hitting into the deep, we had to just milk it when we were batting. "We're going pretty well in this competition so hopefully we can get another win on Tuesday and keep going with this form." "We'd like to have had someone bat all the way through and more partnerships in the middle, and we lost wickets at the wrong time. "I was happy to get a couple away at the end to give us half a sniff, but it was a shame to be given out. It whacked me on the arm and that was painful enough. "It's a bit tricky to bowl here, when the batters get going it's hard to stop them, but it was a good game of cricket. "We're hungry to win and if there's something to take away from this, it was that we never gave up, and that hunger continues into the next game."